Paula Cooper Gallery is pleased to present an exhibition of recent work by Bing Wright at the 521 West 21st Street location. The exhibition presents new abstract photographs with silver leaf that explore the interplay of surface and layered space. Using a combination of digital technology and traditional collage, Wright embeds particular motifs (such as the strip or the frame), at various levels of representation within the same image, creating an aggregate picture of actual, photographed, and re-photographed silver leaf. 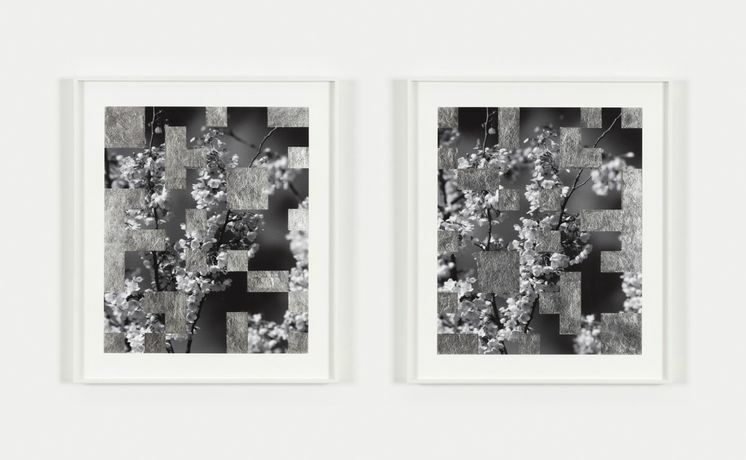 The shimmering silver surface, existing both as photographic image and as material layered atop it, becomes an index of a continually shifting relationship between figure and ground.